I am myself a female nearing 60 so I had a special empathy for Mama Jose when John, in a combination of exasperation and humor told me this story. First, to all male readers: we do follow the same basic trajectory. During those first 20+ years, each year is an accomplishment. The ascent to puberty and beyond, we fix the ax well over our heads and pull ourselves up. Somewhere along the way, I no longer remember where, the terrain evens out. Now gravity has taken over and we bump down cog by cog. You, my colleagues, talk about prostrate this and that, so be it. Women have their own eventualities. Mama Jose, our cook and housekeeper in Kindu brought her eventuality to PapaJohn, my husband, who was in Kindu a week before heading for the Lomami. 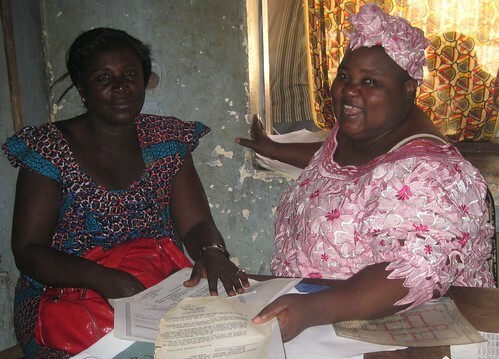 Last week, when Ma José, the menagère at our project house in Kindu announced that she was feeling hot and swollen. I suspected just another case of malaria and suggested she head off to our local clinic for the routine tests. No, she said, it was not malaria; her lower back was the problem. It seems – at least in Congo — when a woman announces lower back pain it means problems in the pelvic area. Ovarian cysts? Fibroids? The next day did not bring reprieve. And alas, Kindu’s government-employed doctors were on strike for a pay raise. 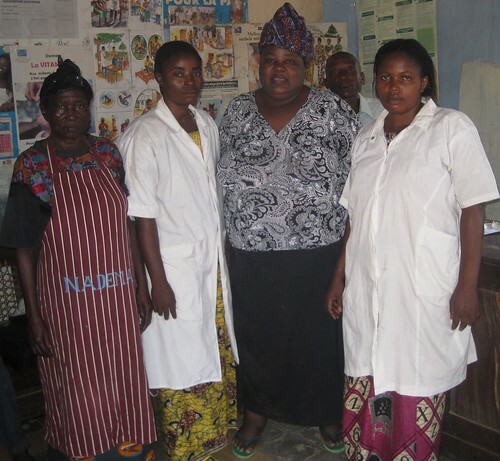 Ma José didn’t want them anyway; she knew a midwife, Mama Anna, who, though little schooled, could “read women” and was favored by Kindu’s ladies for reproductive health needs. Though somewhat skeptical, I agreed and said we would cover the consultation. That afternoon Ma José came back confident; Mama Anna had the solution. She laid the pro-forma receipt on my desk: $186. Sticker shock. I expected a 5 to 15 dollar fee and diagnosis. Not a pre-paid solution. I asked just what this cash outlay would cover as the slip of paper provided little more than a statement for three monthly injections plus consultation fees. José seemed at a loss to provide me with any insight into what was actually wrong with her, but she was emphatic that the injections would bring her back to good form. “Come, Mama Anna will explain,” she responded. That afternoon, after the day’s heat had dissipated, I followed Ma José into one of the back alleys surrounding Kindu’s market. José led me through a half opened gate into a cluttered courtyard dominated by an aging colonial era brick house with shuttered windows. The sagging front door was propped open by the rusted engine block of an old motorcycle. Over the door a faded sign read “Naissance Desirable et Maternité sans Risque (NADEMA)”, or Family Planning and Risk-free Childbirth. I heard a shrill female voice call out in Swahili for a coca cola, and then a few seconds later a second shouted order for a purse to be brought from the office. José led me through the open door into what appeared to be the reception and waiting room lit only by shafts of light coming through half-open shutters. Sitting on a small chair behind a desk heaped with papers, packets of pills, syringes and vials of medicine was a huge woman in full traditional kikwembi and head scarf. Mama Anna on right reassures Mama José. “Bonjour Papa, I am Anna and welcome to NADEMA,” Anna greeted me, grasping my hand in a firm grip. Anna pointed me to a chair in front of her desk, and Ma José to a second chair. There was a shouted order for José’s fiche. A teenage girl brought a small sheaf of papers. “Here is Mama Jose’s file”, Mama Anna told me in Swahili, pulling out a small piece of paper. Smiling at me, and anticipating my question, she plunged right into the heart of matters. “Mama José is showing the first signs of menopause.” I drew a sigh of relief. At least I knew we were not in for a major surgical intervention. Mama Anna cut me off. “Ma José will feel a lot better”, she informed me, “if she can ease into this transition with a little assistance.” A series of injections to prolong the diminished cycles and curettage to top it off would make her feel a lot happier she told me. Mama José was beaming and nodding vigorously. Anna rummaged through her papers and held up a large packet. “This is the female condom”, she announced proudly. She promptly opened the package and pulled it out for us to see. Ma José touched it gingerly. “You slip it right in like this”, Anna, went on, showing us the move with a graceful sweep of her hand. Mama José took the condom and inspected it closely. “Why it even has its own makumasi” she exclaimed, using a Swahili expression locally used for a number of body excretions…. Mama Anna, like a salesperson in a show room moved on to the other options she could provide: injections, a subcutaneous hormone “stick”, pills, even a set of multi-colored sliding beads to count the days from period to fertility for those who opted to “watch their dates”. In the end, we settled for a single injection and vitamin pills, $55 total. Later that week, at the end of the day’s work, I asked Ma Jose how she was feeling. She gave me a genuine full-face smile; perhaps we’ve kept the doldrums from the door for a bit. Mama Anna and some of her staff. I think the man in back is the doctor on call. Mama Anna is no quack. She recently delivered two healthy twins, both of whom were in the wrong position in the womb. Mama Anna turned them around and was there to “catch” them for their first big breath of oxygen. That is no small accomplishment and would not even be attempted in most high ranking western hospitals. Instead, automatic, major caesarian section. Crispin, who is our team leader covering several of Maniema’s base-camps, had a particular interest in NADEMA. 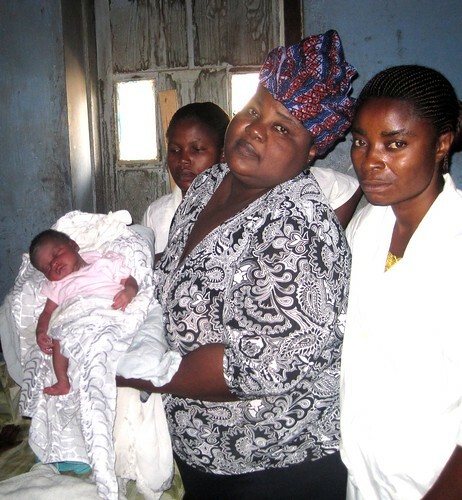 His wife, newly arrived in Maniema was pregnant and about to give birth. He tells me that NADEMA, was put together by mama Anna in 1996 when she became frustrated by the persistent high female and infant mortality in Kindu. NADEMA , Crispin told me, not only helps with birthing but also with planned parenthood, birth preparation, menopause, and certain women’s venereal diseases. A new healthy wee one at NADEMA. 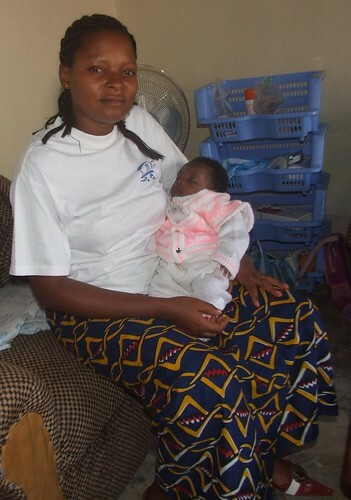 Crispin’s wife gave birth to a healthy baby girl at NADEMA and the new baby’s name is Terese. I am honored. 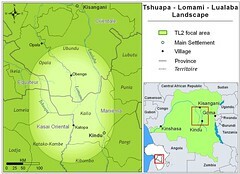 And I am even more honored that Terese’s Mom’s name is Lomami! I have, however, told Crispin that it would make sense to make use of mama Anna’s planned parenthood options as baby Terese is, afterall, number five. He agreed. This entry was written by Terese Hart, posted on 2010-11-23 at 3:10 pm, filed under Kindu. Bookmark the permalink. Follow any comments here with the RSS feed for this post. Post a comment or leave a trackback: Trackback URL. Love the story and love the honoring of a good midwife…. The ability to ‘read women’ and provide what they need is ESSENTIAL in any good country and it sounds like Mama Anna could teach the USA medical system a lesson or two. I must come and play with my bonobo cousins soon. Well I hope you do come soon and bring Ewango and do a few botanical inventories in their understory (and maybe a few plots for the canopy and subcanopy as well) Smiles!